An author from Illinois gives a new definition to the words ‘love’ and ‘family’ in the first book of his LGBTQ-themed family and romance series. The book offers readers an LGBTQ retrospective of the 1970s and 1980s. Looking for a great read written by a gay author? 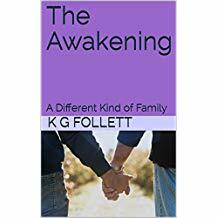 Pick up The Awakening: A Different Kind of Family by K G Follett. This is the first installment of a trilogy that narrates the life of the main character Brad Kelly. A Different Kind of Family started as a short story and, like most unfinished manuscripts, was kept away in a file cabinet until found by the author in the middle of spring cleaning in the basement with his husband in 2017. The reunion of author and manuscript sparks memories. Since then, he overcame the aforementioned toxic relationship, married his current husband, and left the past behind. He also gained the motivation to finish his manuscript, reworking the original story and dividing it into three free-standing books that address the different “eras” of Brad’s life, the first of which is The Awakening. The Awakening opens in July 2014, with Brad getting up from bed and preparing for “The Big Day”. Readers learn that Brad is already advanced in years. The story then shifts to the August of 1973, as the 18-year-old Brad prepares for college. Soon after, Rob, his best friend since junior high school, is kicked out of home by his fundamentalist parents due to his sexuality. Rob then moves to New York to pursue a career on stage. Brad’s mother, Betty, learns of her son’s sexuality and accepts him, although with some reluctance. The story then follows with Brad being rejected by his sister and brother-in-law, seeking the gay experience, gaining employment, meeting and building a long-term relationship with Randy, mourning over the passing of Rob and Betty, striking friendships, and above all, building a non-traditional family. The Awakening invites readers to reflect on the lives of the LGBTQ community in the early days of the gay rights movement, when coming out was often scary and dangerous, coming with the risk of being rejected by family. Many of today’s protections for LGBTQ in the 1970s and 1980s did not exist, and the AIDS crisis cost the lives of many gay men. Amazon customers find the book “very compelling” and “uplifting and heartbreaking… a wonderful story of love, triumph, tragedy, and perseverance in the face of adversity”. The book earns praise for its real and relatable characters and well-developed narrative. Don’t miss the first public display of the book at the upcoming 2018 Frankfurt International Book Fair on Oct. 10 to 14, 2018. K G Follett’s A New Beginning: A Different Kind of Family (book two) and Love Matters: A Different Kind of Family (book three) complete the trilogy. He is also the author of The Bears’ Den series: The Bears’ Den: Frankie & Josh, The Bears’ Den: Jacob Makes Three, and The Bears’ Den: Transformations.